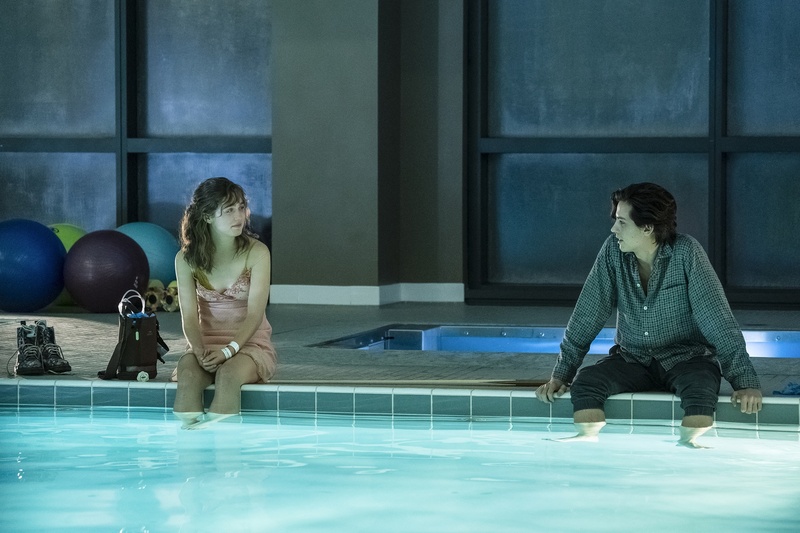 Haley Lu Richardson stars as Stella (left) and Cole Sprouse stars as Will (right) in “Five Feet Apart,” directed by Justin Baldoni. It’s hard to review a teen romance drama. Sure, they have changed over time. Outfits become less denim-heavy and technology more touchscreen-centric, journal entries become vlogs and online chat rooms in "A Cinderella Story" (2004) become FaceTime calls in “Sierra Burgess is a Loser” (2018). Sometimes, the changes aren’t insignificant — “Love, Simon” (2018) and “To All the Boys I’ve Loved Before” (2018), for example, brought refreshing representation to a genre that’s almost exclusively populated by straight, white characters. In the end, however, the tropes are almost always the same: the repressed romantic tension-filled first encounter, the goofy but supportive sidekick/best friend, the falling-in-love montage sequence, the dramatic moments of heightened tension and their tear-jerking resolutions. Not all teen romances follow this formula, but “Five Feet Apart,” for the most part, does. A chalkboard with a sappy, motivational quote scrawled out in cursive; photos of constellations and watercolors of the ocean thumbtacked to the wall; friends dropping by to eat junk food and chat about boys — in the opening scene, Stella Grant (Haley Lu Richardson) seems like just another teenage protagonist. But as soon as her friends walk out the door, she puts on her oxygen tube, and the viewer is introduced — in vlog form, of course — to the life of a teenage cystic fibrosis patient. Stella takes us through her daily routine meticulously: scheduling her treatments, FaceTiming her best friend Poe (Moises Arias), and crossing things off her to-do list (which itself is depicted more often than her actually completing the items). This routine is disrupted by one suave, too-cool-for-the-hospital, obligatorily dreamy Augustus Waters — er, Will Newman (Cole Sprouse). Stella, who is Will’s Hazel Grace, does much of the expositional work for the viewer. “You’re the kind of guy who ignores the rules because it makes him feel in control,” she says, within 30 seconds of meeting Will. His quip oozes with melodrama: “It’s just life. It’ll be over before you know it.” The two, who are already standing six feet apart to not catch each other’s CF bacteria, are further separated by Barb (Kimberly Hebert Gregory), the endearing, caring nurse who seems to be the only one who’s keeping the teenagers alive — but it’s too late. Stella and Will, within the first hour, have gone from being fundamentally antagonistic to inexplicably in love. What follows is a sort of hour-long push and pull: Stella and Will push that six foot limit, in a triumphant declaration that is probably medically unsound, to five feet, as Barb tries desperately to pull them apart, and Poe flits about pushing and pulling on everyone’s heartstrings with his quirky but unwaveringly kind antics. Poe is the real star of the film. Arias makes the most of the hackneyed best friend role to which he has been relegated; his quirks are endearing, his jokes land, and his quips draw chuckles. In response to Will asking why he hasn’t made a move on Stella, he retorts, “It’s because she’s not a he.” One of his scenes in the second half ends up being one of the most poignant and touching in the whole film — to elaborate on it would be to spoil the film. Other actors surprise with impactful performances. Gregory gives a powerful performance as Barb, illuminating the strength, willpower, and care that so many nurses embody. Stella does a fair bit of illuminating herself; she shares with the world the often unsung experiences of cystic fibrosis patients, who make up around 30,000 cases per year in the United States. At times, the film is a touch too melodramatic. In one scene that is supposed to be romantic but that is almost as cringy as the rom-com staple of a flirtatious billiard game, Will and Stella are in adjacent hospital beds, screaming and refusing to leave each others’ sides while hospital workers struggle to separate them. For the most part, “Five Feet Apart” checks off all the boxes: Expect to chuckle liberally, cringe occasionally, and cry inevitably, although not quite when one would expect. For those who appreciate a good tear-jerking teen romance, expect a reaction similar to “The Fault in Our Stars” back in 2014 — it probably won’t be winning any Oscars any time soon, but who cares?